With the school holidays looming, the hunt for affordable domestic flights is on! The only public holidays this month, Youth Day, is on Saturday the 16th of June 2018. Therefore it doesn't affect flight prices on or around the date. However towards the end of the month we notice a steady price increase on most routes, as the school holidays start on the 22nd of June 2018. Try to avoid travelling on that weekend if possible or simply look for dates highlighted in green below. If you are travelling on a budget, the first few weeks of the month are generally more affordable than the last two. Check each route below to find the most affordable dates to travel on this month. Kulula flights from JNB to CPT : Try to avoid flying from JNB to CPT on the 22nd where possible as that is by far the most expensive date to travel on. Kulula flights from CPT to JNB : Weekend flight prices are slightly elevated on this route, with flights on the 24th being the most expensive. Kulula flights from Lanseria to Cape Town : Avoid travelling on the dates marked in pink, as those are the most expensive dates to travel on. Kulula flights from Cape Town to Lanseria : Cheap flights are readily available throughout the month, with the only dates to avoid highlighted in pink. Kulula Flights from OR Tambo to Durban : The cheapest flights are highlighted in green below. Kulula Flights from Durban to OR Tambo : Flight prices are reasonable throughout the month, but look for dates highlighted in green if you're on a budget. Kulula flights from Lanseria to Durban : Flight prices are fairly similar throughout the month. Avoid travelling on the dates marked in pink, as those are the most expensive dates to travel on. Kulula one-way flights Durban to Lanseria : Cheap flights are easy to find on this route. If you are travelling on a budget, try to avoid the 11th and 12th of June as those are the most expensive dates to travel on. Kulula flights from Johannesburg to George: Where possible try to avoid travelling on the 25th, 28th and 29th of June 2018. Kulula flights from George to Johannesburg: Flight prices won't influence your travel plans this month as prices are the same on (almost) all dates. Kulula flights from Cape Town to Durban : The price difference between the cheapest and most expensive flights is astronomical on this route. Try to avoid travelling on dates highlighted in pink. 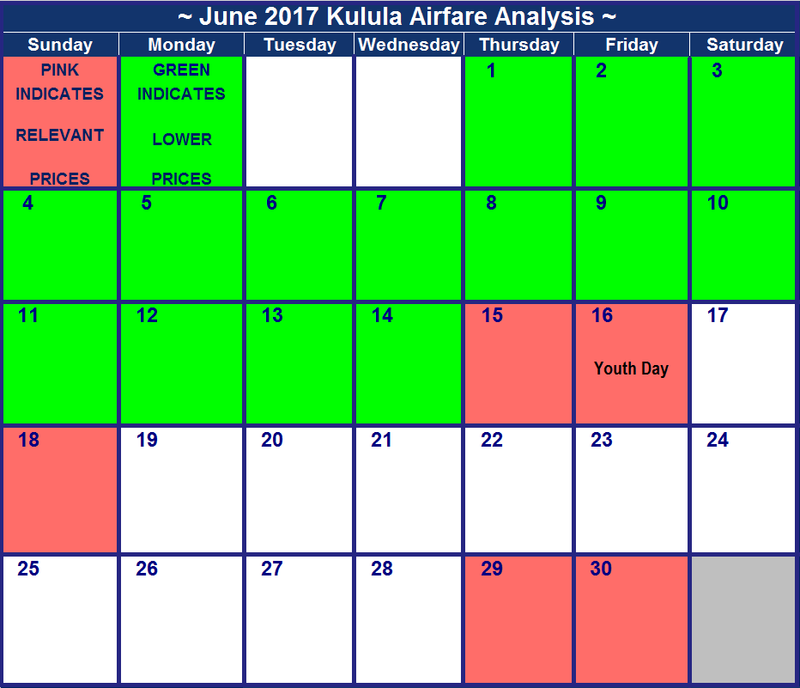 Kulula flights from Durban to Cape Town : Travel on dates highlighted in green where possible as those are the cheapest dates to travel on. Kulula Flights from Johannesburg to East London : Where possible, avoid travelling on Fridays as those are generally the most expensive days to travel on. Kulula flights East London to Johannesburg : Tuesday and Wednesday flights are the most budget-friendly days of the week to travel on. The school holidays only start at the end of the month, making June a fairly affordable month for domestic travel. The 16th of June, Youth Day, is a Friday creating a long-weekend. Flight prices are slightly elevated on the 15th, 16th and 18th for those looking to create a mini-break around these dates. Flight prices are also slightly elevated towards the end of the month, when the school holidays start. If possible, avoid travelling on the 29th and 30th to save. Kulula flights from JNB to CPT : Try to avoid flying from JNB to CPT on the dates around the public holiday on the 16th and the end of the month. Kulula flights from CPT to JNB : Flight prices are relatively consistent throughout the month, with prices elevated on the 18th. Kulula flights from Cape Town to Lanseria : Cheap flights can be found throughout the month, as indicated in green below. Kulula Flights from OR Tambo to Durban : Flight prices are incredibly similar throughout the month. Avoid travelling on the dates marked in pink, as those are the most expensive dates to travel on. Kulula Flights from Durban to OR Tambo : Flight prices are incredibly similar throughout the month. The only dates to avoid are the 5th and the 18th. Kulula flights from Lanseria to Durban : Flight prices are incredibly similar throughout the month. Avoid travelling on the dates marked in pink, as those are the most expensive dates to travel on. Kulula one-way flights Durban to Lanseria : Cheap flights are easy to find this month on this route. If you are travelling on a budget, try to avoid the 18th of June as that is the most expensive date to travel on. Kulula flights from Johannesburg to George: Affordable flights are readily available throughout the month, with the only dates to avoid around the public holiday and start of the school break. Kulula flights from George to Johannesburg: Cheap flights are incredibly easy to come by on this route, but if possible avoid travelling on the 18th. Kulula flights from Cape Town to Durban : The price difference between the cheapest and most expensive flights is astronomical on this route, with over a R1000 difference! Kulula flights from Durban to Cape Town : Affordable flights are hard to come by, with the 13th, 14th, 20th, 21st and 22nd being the only dates with cheap flights available. Try to avoid the 4th until the 6th at all cost. Kulula Flights from Johannesburg to East London : Where possible, avoid travelling on the 15th and 30th of June as those are the most expensive travel dates. Kulula flights East London to Johannesburg : Cheap flights are readily available on this route throughout the month. Avoid travelling on the 18th if you are on a tight budget. Despite the fact that winter is usually low season in the travel industry, June is jam-packed with possible expensive travel dates as the 16th is a public holiday and the school holidays start on the 24th. The 16th of June 2016 is Youth Day and as it falls on a Thursday, passengers can create a very long weekend by taking leave on the Friday. This causes elevated flight prices on the days leading up to and after the public holiday. Similarly, the school holidays only officially start on the 24th of June 2016, but many families choose to go on holiday as soon as the exams ends. This causes flight prices to elevate a few days before the school even closes. Affordable airfares are however easily found during the first two weeks of June. Kulula flights from JNB to CPT : Try avoid flying from JNB to CPT on the dates around the public holiday on the 16th and the start of the school holidays on the 24th. Kulula flights from CPT to JNB : Flight prices are relatively consistent throughout the month, with prices only slightly elevated on the 19th. Kulula Flights from OR Tambo to Durban : Flight prices are incredibly similar throughout the month, with only a R6 difference between the cheapest and most expensive flight. Kulula Flights from Durban to OR Tambo : Avoid travelling on the 19th if you'd like to save a few bucks. Kulula flights from Lanseria to Durban : Avoid travelling around Youth Day and the start of the school holidays if you'd like to save on your flights. Kulula one-way flights Durban to Lanseria : There are only two dates to avoid if possible- the 19th and 20th. Kulula flights from Johannesburg to George: Affordable flights are readibly available throughout the month. Kulula flights from George to Johannesburg: Avoid travelling on the dates highlighted in pink below as those are the most expensive dates to travel on. Kulula flights from Cape Town to Durban : The price difference between the cheapest and most expensive flights is astronomical on this route. Kulula flights from Durban to Cape Town : Tuesdays are generally the cheapest day of the week to travel on this month. Kulula Flights from Johannesburg to East london : Where possible, avoid travelling on the 15th, 16th, 24th, 25th and 26th of June as those are the most expensive travel dates. Kulula flights East London to Johannesburg : Cheap flights are readily available on this route throughout the month. This was surveyed on the 5th of May and the mor time that has passed since then, the likelier that flight prices might have changed. 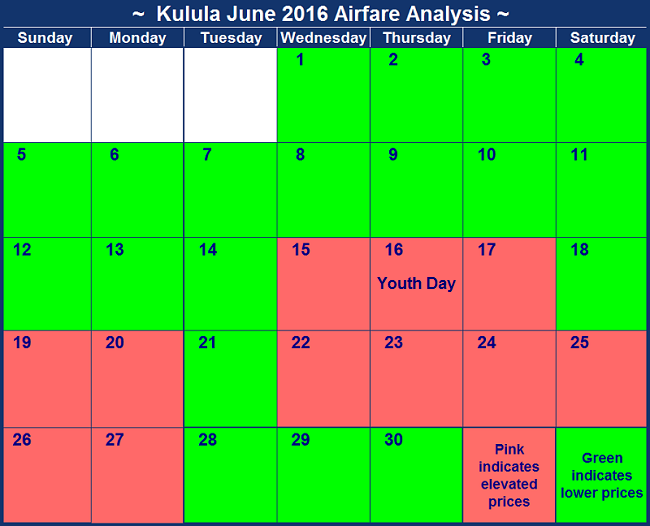 Kulula's June 2015 flight prices are generally elevated around the 16th, Youth Day. So if you are flexible you'll likely be able to benefit from affordable flights throughout the month. Below are the cheapest flight prices on each day of the month. There is only one public holiday in June 2015, and that is Youth Day on Tuesday, the 16th. Unfortunately it does not create a long weekend, but if you've got a spare day of leave you might be able to create a nice long break. School holidays start on Friday the 26th June 2015 (running until the 19th July), and so you can expect airfares to be especially elevated around the end of the month. Kulula flights from JNB to CPT : Try avoid flying from JNB to CPT on the 11th, 12th, 26th and 27th of June. Kulula flights from CPT to JNB : Prices are consistent throughout the month, just avoid travelling on the 15th, 16th and 21st. Kulula flights from Lanseria to Cape Town : Airfares are elevated on the 11t, 12th, 26th and 27th of June. Kulula flights from Cape Town to Lanseria : Airafrwes remain consistent throughout the month and only spike on the 15th, 16th and 21st. Kulula Flights from OR Tambo to Durban : If you are flexible you can benefit from the cheap flights on the 10th of June. Kulula Flights from Durban to OR Tambo : You should avoid travelling on the 1st of June, which is the most expensive day to travel on during the entire month. Kulula flights from Lanseria to Durban : Airfares are only slightly elevated neat the end of month with the cheapest airfare during the entire month on the day before Youth Day. Kulula one-way flights Durban to Lanseria : Airfares are under R1000 on all dates. Kulula flights from Johannesburg to George: There are only two dates to avoid travelling on this mont - the 11th and 26th. Prices are quire consistent otherwise. Kulula flights from George to Johannesburg: Avoid flying on the 16th and 21st of June 2015. Kulula flights from Durban to Cape Town : Avoid travelling at the start of the month. Kulula Flights from Johannesburg to East london : The dates to avoid flying in June 2015 are the 11th,12th, 26th, and 28th. Kulula flights East London to Johannesburg : Avoid flying on the 16th & 28th of June, otherwise airfares are level. Kulula's June 2014 flight prices are generally elevated around the time of the public holidays, so it pays to build a bit of flexibility into your schedule and try avoid travelling on those dates (of course those are also the most appealing dates for many to fly on). Below are the cheapest flight prices on each day of the month. There is only one public holiday in June 2014, and that is Youth Day on Monday, the 16th. As it falls on on a Monday this creates a long-weekend, and you can expect flight prices to be elevated on the weekend from 13th to the 16th June. School holidays start on Friday the 27th June 2014 (running until the 20th July), and so you can expect airfares to be especially elevated on the 27th and 28th June 2014. Kulula flights from JNB to CPT : Try avoid flying from JNB to CPT on the 12th, 13th, 14th, 26th, 27th and 28th of June. Kulula flights from CPT to JNB : Airfares are elevated on the 16th and 17th of June. Kulula flights from Lanseria to Cape Town : Airfares are elevated on the 12th, 13th, 27th and 28th of June. Kulula flights from Cape Town to Lanseria : Airfares are elevated on the 16th and 17th of June. Kulula Flights from OR Tambo to Durban : Avoid travelling on the7th, 13th and the 28th of June. Kulula Flights from Durban to OR Tambo : All days had airfares under R1000. Kulula flights from Lanseria to Durban : Interestingly, airfares on the 7th June are elevated. Kulula flights from Johannesburg to George: Avoid flying on the 12th, 13th, 27th, 28th and 29th of June. Kulula flights from George to Johannesburg: Avoid flying on the 16th June 2014. Kulula flights from Cape Town to Durban : Airfares are generally over R1000. This may be because Kulula only has 1 flight a day on the route (Comair focus on British Airways branded flights on the route). Kulula flights from Durban to Cape Town : Airfares on this route are also generally over R1000. Target flying Kulula on the 10th, 11th, 18th and 25th of June. Kulula Flights from Johannesburg to East london : The dates to avoid flying in June 2014 are on the 12th, 13th, 27th, 28th & 29th. Kulula flights East London to Johannesburg : Avoid flying on the 16th & 17th June, otherwise airfares are level. On the 29th May 2013 we decided to take another look at June 2013 flight prices. Obviously these airfares are no longer valid, and are shown for research purposes only. On the 22nd of March 2013, we took this snapshot of airfares. Naturally they're no longer valid, and are retained for historic reference purposes alone. On the 4th April 2011 we had a look at June 2011 flight prices. Naturally they are no longer applicable today, but are interesting to look at from a historical perspective. Avoid flying JNB-CPT on the 15th, 16th (Youth Day), 23rd, 24th and 25th June (R929) - if you must flyin on those dates, rather fly from Lanseria to Cape Town. Avoid flying from Johannesburg to George on the 15th, 16th (Youth Day), 25th and 27th of June. Avoid flying from Cape Town to Durban on the 25th of June.